Through the diligent implementation of our sustainability strategy, we made significant progress in minimizing our environmental footprint. 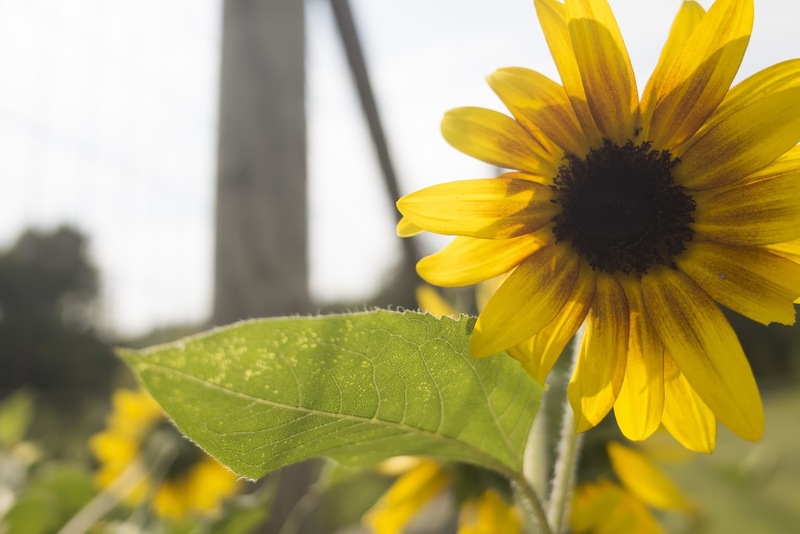 “We are thrilled to announce that we surpassed several of our 2020 eco-effectiveness goals this year due to the concerted efforts of our Green Teams around the world,” said Kip Cleverley, Vice President, Global Sustainability. Below is more information on how we exceeded three of our environmental targets – emissions, water, and waste – several years early. 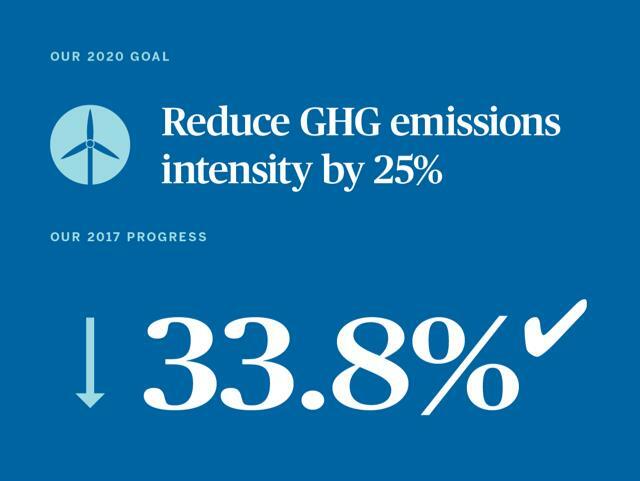 In 2017, we decreased our greenhouse gas emissions by 14.7% from the prior year, resulting in an overall reduction of approximately 33.8% since 2010. 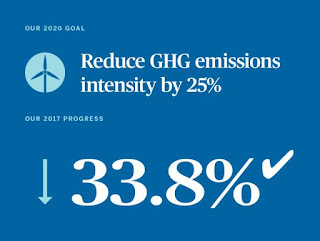 We thus surpassed our 2020 market-based global GHG (Scope 1 and Scope 2) intensity goal – of a 25% reduction from a 2010 baseline. We achieved this by reducing our overall energy intensity, procuring more renewable electricity, and relocating one of our facilities – a Fragrance Ingredients facility in Hangzhou, China – to a more eco-effective facility. The new location is equipped with high-efficiency natural gas boilers to generate the steam needed for production, allowing for a significant reduction in emissions. We also furthered our commitment to renewable electricity in 2017. As part of RE100, a global initiative uniting over a hundred companies in a shared commitment to procure 100% of electricity from renewable sources. We are focusing on and making great progress in obtaining our electricity from renewable sources and driving our Scope 2 emissions to zero. In 2017, approximately 33% of our global electricity portfolio came from renewable sources, including both wind and solar. This includes 5.2 MWh generated by our on-site wind turbine at our Tilburg, the Netherlands facility and 4.1 MWh generated by the solar field in Hazlet. We were identified as a global leader for our actions and strategies to address climate change. We earned a spot on the CDP Climate A List for the third year in a row and were awarded a position on the Supplier Climate A List. IFF is among the 2% of organizations participating in CDP’s supply chain program to be awarded a position on the Supplier Climate A List. 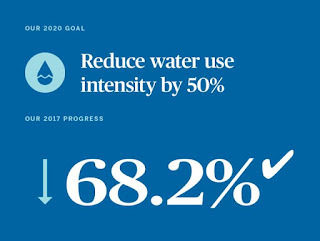 We made strides in reducing our global water footprint – already exceeding our proposed 2020 goals twice to date. In 2012, we set a 2020 goal of a 25% reduction in water use intensity against our 2010 baseline. After achieving that goal in 2014, we increased it to 50%, which we again surpassed in 2016. In 2017, we again exceeded our target by attaining a 68.2% reduction from 2010. Last year, we withdrew approximately three million cubic meters of water from groundwater and municipal sources. We achieved an overall year-over-year water use reduction of approximately 23.3% due to facility relocation and several water-saving projects recently implemented at the site level. Our local Green Teams drove these reductions by reviewing their site and current procedures. After identifying areas of improvement, the teams developed projects such as eliminating once-through cooling, improving cleaning procedures and finding and repairing water leaks. We are also evaluating how to further our efforts to recycle and reuse water in order to minimize the amount of fresh water we consume. Additionally, the new Fragrance Ingredients facility in Hangzhou, China was designed to minimize its environmental impact. By leveraging the latest technologies available, the new facility will be one of IFF’s most water-efficient manufacturing locations globally. As we continue to shrink our water footprint and identify ways to reduce our consumption, we are currently developing our water stewardship strategy. As global water demand continues to grow, water scarcity will be an increasingly important issue. We are therefore working towards a water management strategy to address these concerns and will prioritize watershed management and engagement with local communities. Eliminating the concept of waste is one of the core principles of the circular economy and one of IFF’s Positive Principles in our sustainability strategy. Our success in reducing waste stems from the completion of several initiatives targeting high-waste generation parts of the production process. These projects address waste during the washing phases of production, so every efficiency improvement will also result in water savings. Our Operations and R&D teams have also made other improvements through process and product innovations. For example, our Benicarló, Spain, facility installed advanced water treatment technology to generate pure distilled water from a waste stream and decrease the amount of hazardous waste produced in the process. This technology is expected to reduce hazardous waste generation from this plant by 3,000 metric tons per year. Due to these efforts and others, we decreased our hazardous waste generation by 29.3% in 2017, from 0.079 to 0.056 metric tons of hazardous waste per metric ton of production. 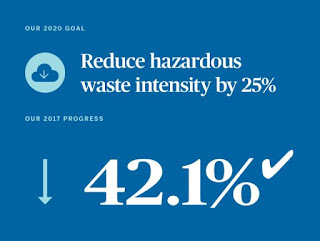 Overall, we have reduced hazardous waste generation by 42.1% against the 2010 baseline, exceeding our 2020 goal. We continually strive to gain a deeper understanding of the impact that acquisitions and our product mix can have on our global hazardous waste generation. Our ever-changing product portfolio makes it difficult to address specific waste streams, complicating our waste reduction strategy. This affected our overall waste generation trend in recent years; however, by continuing to monitor trends that affect our waste, and tracking and reporting our progress, we achieved our goal in 2017. We are also making progress on waste reduction through Zero Waste to Landfill (ZWL) efforts. A ZWL goal encourages employees to implement innovative solutions to reduce waste generation and reuse and recycle materials where possible. To understand the feasibility of achieving Zero Waste to Landfill, we piloted a program with our South Brunswick, New Jersey, U.S. flavors facility. In 2017, the site was certified ZWL from the third-party Green Circle Certifications. This certification is not only an IFF first, but an industry first. The South Brunswick facility diverts waste through the use of the 4R’s – reducing, reusing, recycling, and recovering energy through a waste-to-energy facility. The certification process includes an onsite audit (to inspect outgoing waste and recycling streams) and a downstream audit (to track IFF’s recycled or reused materials after leaving our facilities). So far, the South Brunswick facility has averted 540 metric tons of waste that included office supplies, unrecyclable packaging materials and contaminated containers which frequently ended up in the landfill. Said Brad Hartzell, Director of Manufacturing, Flavors, North America, “We are proud of South Brunswick's certification,” said Brad Hartzell, Director of Manufacturing, Flavors –- North America. “It is a great example of how IFF is increasing efficiency, cutting costs, and having a positive impact on society and the environment through sustainability." Our South Brunswick facility is now working with other locations to share their learnings and expand our program. As we continue to expand and define our waste disposal metrics and methods, we will develop goals to support the circular economy and eliminate the concept of waste in our operations. 1- The Solar Renewable Energy Credits (SRECs) generated from the Hazlet, New Jersey, U.S. solar array are retained by the array’s owner and IFF is supplied with equivalent Green-e certified Renewable Energy Credits (RECs), along with the electricity generated by the solar array. Qualifying RECs are also purchased for our facilities in Benicarló, Spain; Tilburg, the Netherlands; Jacksonville, Florida, U.S.; the Ottens flavors facility in Philadelphia, Pennsylvania, U.S.; and our creative center in Hilversum, Netherlands.